Pre blocking. 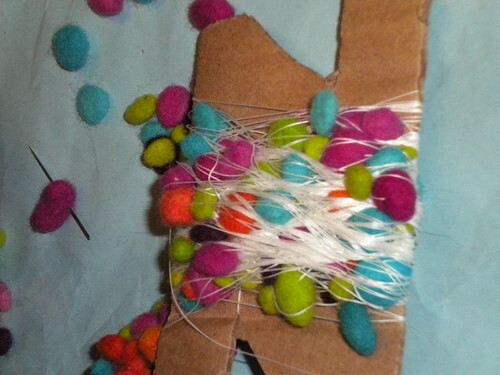 Spun with recycled plastic soda bottle fiber corespun around a cotton core strung with wool felt baubles. 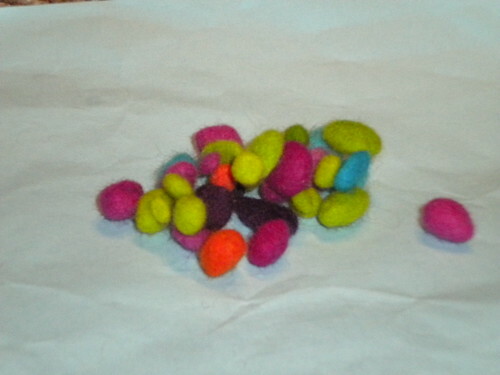 It all started with these colorful felt pebbles, from Lila La Malice (no longer operating as far as I know, she did great felt items). I had only two little packets of them, in all shapes and sizes and colors, from teeny tiny up to about a 1/2 inch. 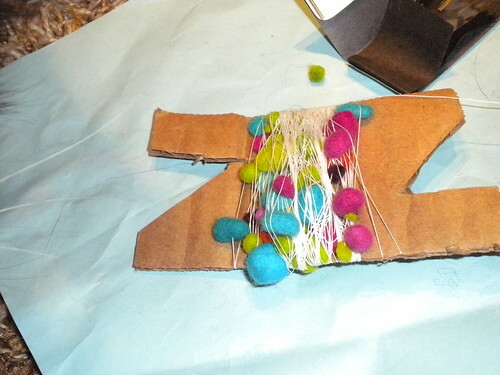 The pebbles are a dense hand felt, but can still be strung easily on to cotton. 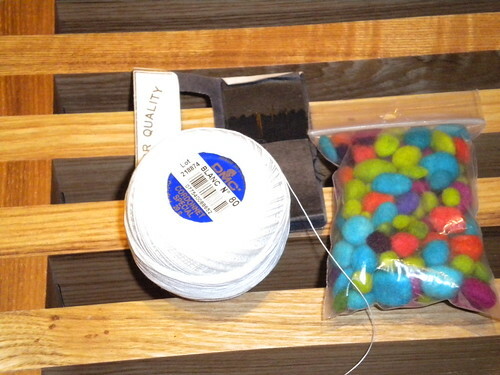 I am using cotton tatting thread, since it is strong and super smooth, which is important when trying to avoid breaking the thread when fuzziness from the felt starts to build up. 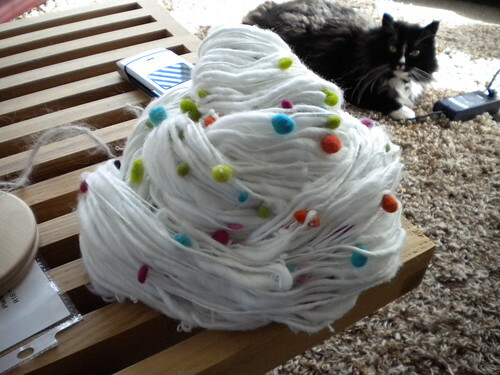 I strung the pebbles on the the thread in two batches, and moved them by hand along the thread to get them in position- each pebble varies from inches to a few feet apart, and there are many many of them over the 100+ yards of yarn, each one placed along the thread by hand. It took a really long time! 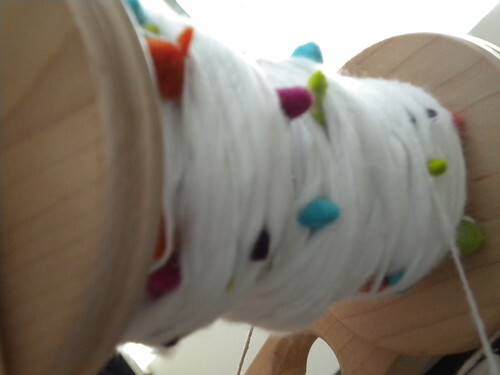 I wound the thread on to a makeshift bobbin while spreading out the pebbles. I made sure to tension it enough that the pebbles wouldn't move around too much and get caught on each other. 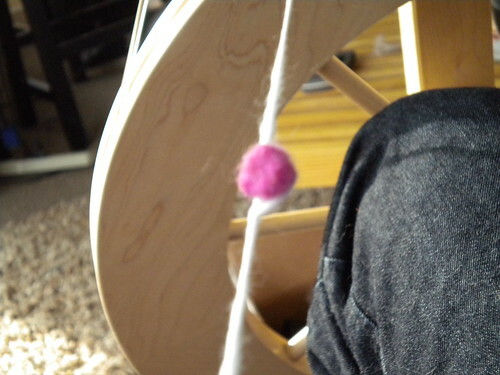 It worked pretty well, I didn't have much trouble unwinding the bobbin while spinning the yarn. 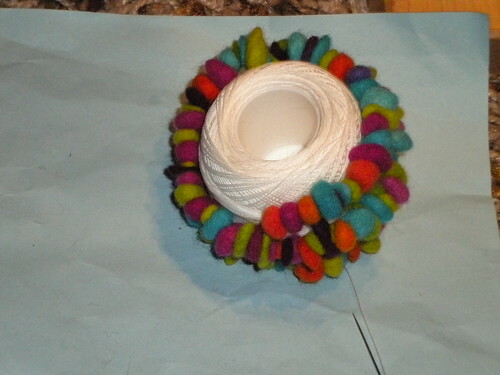 I decided on corespinning recycled plastic soda bottle fiber around the cotton core, since it is bright white. 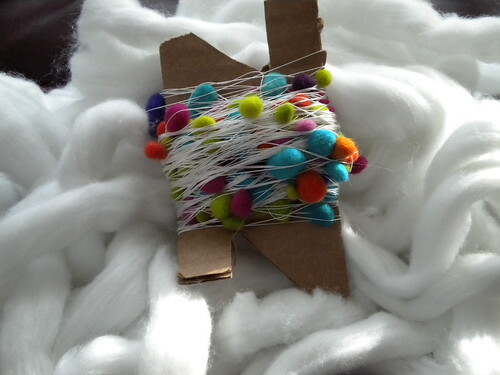 I split the roving up in to chunks and spun it slightly thick and thin around the core, letting it overlap over the felt on one side a bit so it looks like the pebbles are popping out of the yarn.